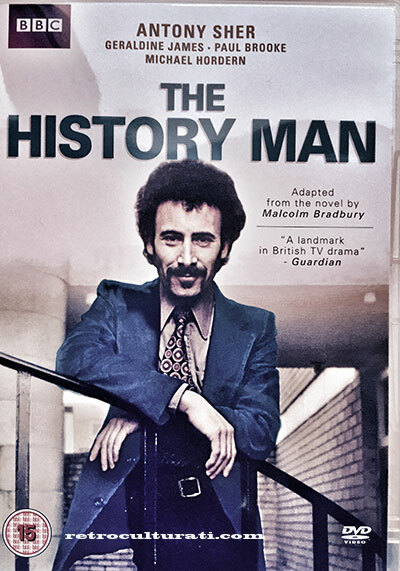 Finally, after considerable efforts Retro Culturati has managed to obtain the dvd of the cult BBC television series, ‘The History Man’. First shown on television in 1981 it was a four part adaptation of the classic 1975 novel by Malcolm Bradbury and this particular blogger’s introduction to the hedonistic lifestyle of the university campus in the 1970s. I can still recall the scenes of the house parties, the pot smoking, ‘Voodoo Chile’ on the turntable and our lead man playing the unscrupulous host with bottles of wine in either hand. Antony Sher starred as Howard Kirk, the central figure of the story. Sporting a handle-bar moustache, waistcoat and flared jeans he epitomised the university look of 1972. Cutting a dash with his female students, Kirk is a radical Marxist who plots, schemes and beds his way through the term whilst his long-suffering wife Barbara, played by Geraldine James attempts to be a mother to their children whilst dreaming of her own lover in London. The television series makes one assume that Kirk has always been the way in which we see him, a womaniser who has a remarkable capacity to practice nothing of what he preaches. For a true insight into Kirk’s character we must look to Bradbury’s novel to see that it was Barbara’s extra-marital wanderings which created the manipulator we are introduced to. Sher plays a remarkable role in the series, he lives and breathes the contradictions of the far-left wing preachers of the seventies and eighties, he plays a man obsessed with himself who rages a hollow war against the machine which affords him the lifestyle he leads. Kirk is left fanning the dying embers of the permissive society, he knows it cannot last and in the end, it doesn’t.